. This scholarship supports talented computer scientists with a disability across Europe by offering 7,000 Euros towards their studies for 2014-15. As part of this commitment, Google has teamed up with EmployAbility, an organization dedicated to assisting disabled and dyslexic students in the transition from education to employment. I’m from Romania and I’m currently in my 2nd year of a computer graphics masters at the University Politehnica of Bucharest. I’ve loved computers and video games since I first came into contact with them. I’m currently working on my dissertation project to combine the power of Kinect and Oculus Rift to create a fully immersive experience. A fun fact about myself, I worked at Gameloft and you can find my name in the credits of the game 'My Little Pony' (yes, this is a game created by fully grown men!). What did you think of the application process? It was straight forward and simple. I asked my parents to help me translate official documents from my native language into English while I focussed on my resume and essays. EmployAbility were also on hand to advise and support me throughout the process. In what way(s) has the Scholarship had an impact on your studies? It allowed me to focus on my studies instead of dividing my time between university and a job. I also used the scholarship money to buy new equipment for my dissertation project. Generally, I feel more confident in my coding abilities and my decision to pursue this career path. What top tips would you give to someone completing the application form? Spend time on your essay to show who you are and your true potential. If you are re-applying, take the time to write a new essay because another year has passed and this is a new you, with new and improved skills and experiences. Also, if you have any difficulty or questions, ask the people from EmployAbility. Aside from the financial benefit, what else did you gain from the scholarship? After reflecting on my scholarship experience, I realized my disability doesn't make me any less capable, it just makes me different and difference is a good thing. People who think differently find the most innovative and creative solutions. Difference is what drives us forward. I met a wonderful, diverse group of people at last year’s Scholarships Retreat where, for a few amazing days, difference was the norm. It really boosted my confidence. Did the scholarship influence your thoughts about a career at Google or within the Tech sector? The experience truly transformed the way I see my life after graduating. Going to a Google development center and talking to the engineers who work there about their day-to day-lives and experiences was priceless. We also had the opportunity to network with Google recruiters, find out more about the hiring process and available positions, not to mention gaining some top interview tips. EmployAbility also offered lots of information about the support available for disabled candidates searching for a job. To top it all off, a little after receiving the scholarship I was invited to interview for a position at Google! What advice would you give someone who isn’t sure they should apply? Think about it this way: Google is investing a lot to search for talented and passionate people like you. But they can't do it all. It's your job to say “here I am” and your duty to yourself to make sure you take every opportunity that comes your way, no matter how unlikely it might seem at first. We are currently accepting applications for the 2014 Google Europe Scholarship for Students with Disabilities. Apply today! Applications close on February 17th, 2014. For questions about the scholarship or your application, please reach out to EmployAbility at googlescholarship@employ-ability.org.uk. Applications are currently open for the Google Europe Scholarship for Students with Disabilities 2014. This scholarship supports talented computer scientists with a disability across Europe by offering 7,000 Euros towards their studies for 2014-15. As part of this commitment, Google has teamed up with EmployAbility, an organization dedicated to assisting disabled and dyslexic students in the transition from education to employment.
. As one of our largest and longest-running residential technical education programs for university students, CSSI continues to develop the next generation of computer scientists and young professionals among underrepresented groups in the tech industry. But such lofty goals require willing hearts. CSSI’s success comes from the hard work and efforts of a small army of Googlers who are passionate about technical education initiatives. And for the first time ever in CSSI history, in 2013 we invited summer interns to participate as resident advisors in the dorms where students reside during the three weeks of the program - essentially turning regular interns by day into mentors by night. Why were you interested in becoming a Resident Advisor for CSSI? Helen: Summer can get boring sometimes after getting off from work. When I received the email about the CSSI RA opportunity, I realized that this was exactly what I was looking for to occupy my time and do something meaningful at the same time. I am passionate about computer science, responsible, reliable and friendly -- somewhat fits the description of an RA, so I went ahead and gave it a try. Liam: It seemed like the perfect blend of what I enjoy about school, being a TA, and Google! When I'm at school I really enjoy my TA job and like seeing when new students understand things. It was especially exciting having the same responsibilities at CSSI because for some of the students it was their first time doing anything related to computer science! It was also a lot of fun to live in the dorms with the students. When I lived in dorms at school I frequently set up activities and made it a really social environment, and that was a really easy (and fun!) thing to do here. Christina: In my freshmen year, I was lucky enough to live in Honors housing at Virginia Tech, and I got to experience living with students from all years of study. As part of the housing, I got to take a seminar for freshmen, and it was such a valuable experience for me that I began leading the class as an student teaching assistant every year since. I have found that each year, the first year students have something new to teach me, and likewise I get to share my experiences as a college student with them. Living with those same students augments the amount of knowledge that is shared and learning that occurs. While I was an Engineering Practicum intern, I served as a teaching assistant for a couple of the CSSI classes, and thought that this program was Google's version of the transformative program I had at my school. When I received the email about the RA program for CSSI, and I was eager to apply since I really enjoyed working for Google and learning in collaborative environments. What were some of your responsibilities as an RA? Christina: Being an RA for CSSI is about more than just being around to help students figure out what to do when they get locked out of their rooms or need help finding out where the laundry room is. I would say the biggest responsibility was getting to know the 30 Mountain View CSSIers and helping them get started with their college careers by hosting conversations on both technical and soft skills, participating in social events and trips, and making sure they were getting the most out of this CSSI experience. Liam: My main responsibility was just to make sure that all of the students were safe over the course of the three weeks. I was also responsible for holding office hours in the evenings to help students with their what they were learning and with their projects. Some of these office hours were more structured, such as the resume workshop that we hosted. Another responsibility of mine was to try my best to make sure that everyone was enjoying their time at Google, so whenever I wasn't hosting office hours I was hanging out with them and playing games with them. What was one of your favorite activities and/or projects as an RA? Jacob: My favorite part of being an RA was the office hours/ just hanging out with the students. Helen: My favorite activities with them were playing board games and weekend outings (esp. Canobi Lake park and freedom trail). I like to hang out with the students - they are amazing, extremely talented and of extraordinary character. I love spending time with them and I miss them! Liam: Playing Avalon with all of the students was really great. Almost all of the students immediately became addicted to the game, so whenever we weren't working on things we were playing it. This was extremely important in building a strong community among the CSSI students and helped create some great friendships (even though during the game everyone is everyone else's enemy!). Not only that, but the game implicitly strengthens critical thinking skills and I felt that it started to show in the students when they started working on their projects. What are 2 things you’ve learned from being a CSSI RA? Liam: Probably the biggest thing I learned is that new computer science students can learn a ton of information in three weeks. At the beginning of the program some of the students had never programmed before in their entire lives, but by the end of the three weeks they had created some really slick and impressive web apps. I thought this was really cool. Another thing that I learned is that even though the students came from all different backgrounds and are going to completely different schools, they were able to find common ground and work together to produce great projects. Even outside of the projects it was pretty awesome to see the diverse community that was built among the students in just three weeks. Christina: 1) It is possible to create lasting, meaningful, and impactful relationships in the short time span of 3 weeks. 2) All of the world's problems can be solved with deep fried PB&Js. Jacob: I've learned that the best way to help address most issues is just to sit back and listen, they tend to resolve themselves. Helen: CSSI has benefited me in a lot of ways. I feel extremely fortunate that I was selected as an RA. Even though I am not a rising freshman, but CSSI has made a big impact on my life in terms of mentorship and support for newer students in my field. Liam: The members of the CSSI team are literally wizards (especially Sarah Henderson since she's actually Merlin). No but really, being an RA for CSSI was a great experience and I'm really glad I did it. It added something entirely new to my internship experience this summer and I seriously encourage any returning interns with any interest to apply for it. High school students injure themselves a lot (I learned how to use a first aid kit effectively). Wrangling 30 high schoolers is sometimes difficult and they can disappear quickly. Remembering room keys is literally impossible. Saying "free hoodies" to freshmen results in a stampede. Want to get involved? The CSSI RA application is open to returning Google interns in the summer of 2014. Email cssi@google.com for more information! 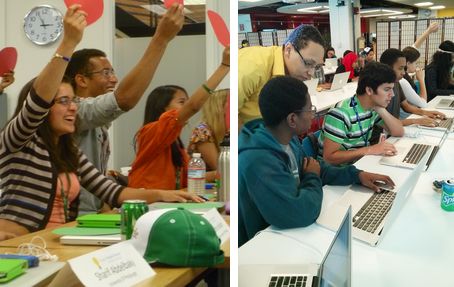 Every summer for the past six years, Google hosts rising college freshmen in our offices for our 3-week Computer Science Summer Institute. As one of our largest and longest-running residential technical education programs for university students, CSSI continues to develop the next generation of computer scientists and young professionals among underrepresented groups in the tech industry. It’s time to announce this year’s 20 grand prize winners in the Google Code-in 2013 contest! Over the last seven weeks, 337 teenagers from 46 countries have been busy working with open source organizations to write code, fix bugs, create documentation and find creative ways to get other students interested in participating in open source, completing a total of 2,113 tasks! Congratulations to all of the students who participated in this year’s contest! You should all be very proud of yourselves. Each of the 10 open source organizations that worked with students during the contest chose 2 students to be their organization’s grand prize winners based on the students’ comprehensive body of work. The grand prize winners are listed below alphabetically (by first name) with their country and the organization that they worked with during Google Code-in 2013. For their grand prize trip the 20 students will be flown to Google’s Mountain View, California headquarters along with a parent or legal guardian in mid April for a four night trip. Students will talk with Google engineers, take part in an awards ceremony, enjoy time exploring San Francisco and best of all make new friends also interested in technology and open source development. We have a special surprise in store for this year’s grand prize winners -- each year the students tell us they’d like to meet the mentors that they worked with during the contest so this year we are doing just that -- one mentor from each organization will be joining the students on the grand prize trip. A huge thanks to all of the students, mentors, organization administrators, teachers and parents that made Google Code-in 2013 awesome! Make sure you have the latest copy of the Android SDK and that you're compiling against at least Android v3.2 (set target in project.properties to android-13) (or higher). . The Google Mobile Ads SDK for Android requires a run-time of Android 2.3 or later (set android:minSdkVersion to at least 9 in your AndroidManifest.xml). This means you can develop with the latest version of the Android SDK and your app will still run on an earlier Android version (2.3 minimum). Add and reference the Google Play services library project in your Eclipse workspace. See the Android instructions for how to set up the Google Play services SDK. Right click on your app project in Eclipse and select Properties. Select Android and then click Add.... Find the google-play-services_lib project and select OK to add the Google Play services library. The project now references the Google Play services library. Add a meta-data tag in AndroidManifest.xml. Google Play services requires you to add a specific meta-data tag within the element in your app's AndroidManifest.xml. data, can be found at Step 2 here. Declare com.google.android.gms.ads.AdActivity in the manifest. The Mobile Ads SDK requires that com.google.android.gms.ads.AdActivity be declared in your app's AndroidManifest.xml. A screenshot can found at Step 3 here. Set up network permissions in the manifest. Required. Used to access the Internet to make ad requests. Optional. Used to check if an internet connection is available prior to making an ad request. For further questions on the installation process, head to the Google Developers forum, where any questions or troubleshooting can be handled. As always, follow AdMob on Google+ for any new updates, and good luck with the continued development of your app for the contest. There have been some excellent app submissions for The AdMob Student App Challenge; however, many of these were submitted without having first successfully installed AdMob to their app. This is an important aspect of the challenge, and an app without AdMob will not be eligible for review by our judging panel. The process to install AdMob is straight-forward; continue reading for a how-to on how to monetize your app with AdMob. I am most proud of creating an entire website from scratch with a team of people that I had never met before in my life. Aside from just technical skills, what is something important you have gained from the program? Arturo: Aside from technical skills, the most important thing I gained from the program was the friendships and connections I made during the program. Google has a truly wonderful culture and thanks to that you are bound to make friendships and meet people that have many things in common with you. I am sure I will be thanking Google for this well into the future. Aneesha: There are so many non-technical (and technical) skills that I gained as part of CSSI that it's hard to choose one but if I absolutely have to pick, I would choose social skills: even though there were 30 of us, we all got really close and we still keep in touch - we have G+ hangouts all the time! I consider my CSSI buddies some of my best friends! 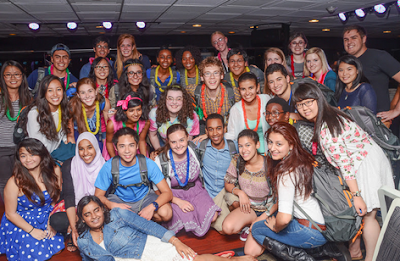 How do you plan to apply what you’ve learned at CSSI in your freshman year? Arturo: I plan on developing web applications with the tools that we were taught in Google and also plan on working on some of these web applications with friends I made in the program. I also plan on taking part on a hackathon with fellow CSSIers. I am sure some of the skills and knowledge acquired during the program will help me a lot with the required courses in first year of University. What advice would you like to share with students who are considering CSSI? Aneesha: DO IT!! It will be some of the best days of your life - you will make great friends and great memories and you'll learn a lot of computer science. The instructors and the TA's are also incredible. You will learn so much from them - not just programming but also how to continue learning computer science on your own. Get involved! If you’re ready to experience CSSI for yourself, apply today! Applications are open for rising college freshmen who will be attending universities in the US & Canada until March 3, 2014. Visit google.com/students/cssi to learn more! Applications for Google's Computer Science Summer Institute (CSSI) and the Generation Google Scholarship have opened for graduating high school seniors! Scholarship recipients are awarded a 10,000 USD or 5,000 CAD scholarship and will attend CSSI in the summer of 2014. Read more below about CSSI and apply today! Applications are due on March 3, 2014. Google hosted its 6th annual Computer Science Summer Institute in the Mountain View and Cambridge offices last summer for students from underrepresented groups considering a C.S. major at universities across the US & Canada. Recipients of the Generation Google Scholarship for high school seniors were among the group of sixty rising college freshmen who participated in the program. Before stepping onto their college campuses, these students from Napa Valley to Nova Scotia (and everywhere in between) stepped first onto our Google campus to begin an exciting 3-week journey into the world of computer science, a la Google style! Designed by the University Programs team, CSSI introduces students to core concepts in computer science with a unique, interactive course curriculum developed and taught by our very own Google engineers. The program includes everything from coding projects and application design, to career panels and fun team time (think boat cruises, city adventures, and photo scavenger “Phunts” built by the students of Google’s 2013 Chrome Academy!). To provide an insider’s perspective on the real CSSI experience this summer, we’re getting into the minds of some CSSI 2013 alumni and sharing their first-hand memories of it with you! What prompted you to apply to CSSI? Arturo: Having no deep knowledge in programming, I understand that no scholarship would have been as valuable as the opportunity to learn Computer Science from Google. I knew that this program was a once in a lifetime experience so I decided to apply. I was not sure I would have the required skills, but I did not want to give up, so I decided to go for it, understanding the program would help me build a bridge for those technical abilities that I did not have, but also help me gain confidence in myself. 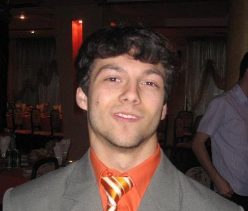 How do you feel about your own abilities in computer science now compared to before you started the program? Nathaniel: I feel more empowered that I can do it. I always had some forthright confidence that it could be done; but, I was always scared of the idea of it being too hard. CSSI boosted my confidence and gave me first-hand exposure to know that I can do it. What are you most proud of accomplishing during CSSI? Nathaniel: Getting to meet amazing people honestly. I brag about the friends that I made, and the people that I met, all the time back home. I'm extremely proud of being given the opportunity to make these great connections. Aneesha: I am most proud of creating an entire website from scratch with a team of people that I had never met before in my life. This is the second in a series of articles about our work environment. See the first. There are few things as frustrating as getting hampered in your work by a bug in a product you depend on. What if it’s a product developed by your company? Do you report/fix the issue or just work around it and hope it’ll go away soon? In this article, I’ll cover how and why Google dogfoods its own products. Google makes heavy use of its own products. We have a large ecosystem of development/office tools and use them for nearly everything we do. Because we use them on a daily basis, we can dogfood releases company-wide before launching to the public. These dogfood versions often have features unavailable to the public but may be less stable. Instability is exactly what you want in your tools, right? Or, would you rather that frustration be passed on to your company’s customers? Of course not! Dogfooding is an important part of our test process. Test teams do their best to find problems before dogfooding, but we all know that testing is never perfect. We often get dogfood bug reports for edge and corner cases not initially covered by testing. We also get many comments about overall product quality and usability. This internal feedback has, on many occasions, changed product design. Not surprisingly, test-focused engineers often have a lot to say during the dogfood phase. I don’t think there is a single public-facing product that I have not reported bugs on. I really appreciate the fact that I can provide feedback on so many products before release. Interested in helping to test Google products? Many of our products have feedback links built-in. Some also have Beta releases available. For example, you can start using Chrome Beta and help us file bugs. From system design documents, to test plans, to discussions about beer brewing techniques, our products are used internally. A company’s choice of office tools can have a big impact on productivity, and it is fortunate for Google that we have such a comprehensive suite. The tools have a consistently simple UI (no manual required), perform very well, encourage collaboration, and auto-save in the cloud. Now that I am used to these tools, I would certainly have a hard time going back to the tools of previous companies I have worked. I’m sure I would forget to click the save buttons for years to come. Google Drive Apps (Docs, Sheets, Slides, etc.) are used for design documents, test plans, project data, data analysis, presentations, and more. Gmail and Hangouts are used for email and chat. Google Calendar is used to schedule all meetings, reserve conference rooms, and setup video conferencing using Hangouts. Google Maps is used to map office floors. Google Groups are used for email lists. Google Sites are used to host team pages, engineering docs, and more. Google App Engine hosts many corporate, development, and test apps. Chrome is our primary browser on all platforms. Google+ is used for organizing internal communities on topics such as food or C++, and for socializing. We are interested to hear your thoughts on this topic. Do you dogfood your company’s products? Do your office tools help or hinder your productivity? What office software and tools do you find invaluable for your job? Could you use Google Docs/Sheets for large test plans?